New Wahoo Book Out Now! 'Wahoo McDaniel Record Book: 1962-1996' Is Available! Greg Mosorjak's new release is a look back at the incredible and lengthy career of legendary wrestler Wahoo McDaniel. This record book chronicles Wahoo's 36 year career in the squared circle. With over 5000 matches listed, from North Carolina to Tokyo, Japan... from Melbourne, Australia to Honolulu, Hawaii... Wahoo McDaniel went everywhere! 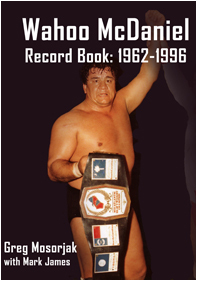 Wahoo McDaniel Record Book: 1962-1996 (250 pp., B&W, 8" x 10") is available for purchase now. It is priced at $22.99 and is available in print at AMAZON.COM.